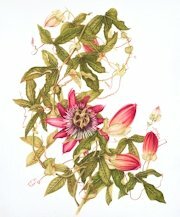 Passionflowers had been on my wish-list for years but the quest for the plant in our local nurseries summer after summer proved futile. After three years when I’d quite given up I spotted a woman wearing a passionflower in her hair & learned she grows numerous varieties of passiflora—she is passionately fond of them. Was that my lucky day! You cannot look at a passionflower without being wonder struck by its architectural grandeur, the queer assemblage of stamens & anthers, pistil & filaments, its exotic flamboyance as well as demure shyness. The buds take a long, long time to unfold but once they do it’s a race against time for brush and paint to keep pace with the open bloom which lasts but a single day! This pantropical plant struck early Christian missionaries in South America as representing the torture & crucifixion of Christ. The “passion” in the flower’s name comes from the sufferings of Christ And long before, in other parts of the world, the open flower reminded people of the face of a clock, or of the blue-skinned Krishna. It also has a key role in folk medicine. Certain species are known for their calming and soothing effects and are used as a remedy for anxiety disorders and insomnia. This painting, the purple passionflower has a companion piece—Passiflora caerulean—which I’d just completed before starting on P. violacea. The species differences provide interesting contrasts & analysis—they certainly display very distinct personalities. It was a thrill and a challenge to document the languid graces of both these vines, the rhythm of numbers, the counts of three and five, their intricate coiling tendrils, the unexpected planes and growth direction. And all the while I kept thinking—this unbelievable drama for but a single day in the sunlight!